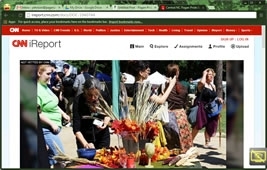 CNN.com reports: On September 21st and 22nd around 3000 people gathered in attendance at the North Carolina State Fair Grounds in Raleigh for the Thirteenth annual Central North Carolina Pagan Pride Day event. The damp weather of Saturday seemed to hamper attendance just a small bit, but as the rained ceased and the skies turned sunny attendance at the event swelled. The estimated attendance to the event is over three thousand. Read full article at http://ireport.cnn.com/docs/DOC-1040744.